A dear friend and mentor, C. D’Bramo asked me to translate this incredible ravioli recipe… I now cannot wait to try it! Oh my! The ravioli are made with a simple mixture of flour and potatoes; wash, peel and cube the potatoes; place them in a large pot, covered with water(add salt to season; about 1 1/2 tsp) bring to a boil, then mash with potato ricer; cool slightly; mix cooled potatoes with the flour and let the dough rest, wrapped in plastic about 30 minutes. Meanwhile, cut the eggplant into cubes, place on a parchment or foil-lined baking sheet; toss with olive oil, garlic and salt; bake at 350 degrees for 20-30 minutes until they are softened, test by crushing them with a fork. 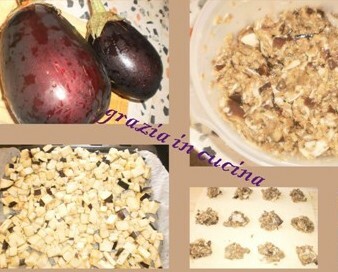 Place the cooled eggplant in a large bowl, mashing with a fork; add the grated scamorza large egg, salt and pepper (if it is wet, you can add the breadcrumbs). Divide dough in half. Roll out the dough on a lightly floured board, adding flour as needed. Feed half through your pasta machine starting with the largest setting, working down to form a long, thin rectangle. Repeat, dusting lightly with flour as needed. Using a pastry brush, lightly brush an egg wash on “empty” sheets; place spoonfuls of eggplant mixture on dough, covering with second sheet of dough. Firmly press around the filling “pillows” to seal pasta. Using a ravioli cutter, or pizza cutter, cut into ravioli forms. Set aside on lightly floured parchment paper. Bring pot of salted water to a boil and work on sauce. Gently toss the ravioli in boiling water (she added a little olive oil to keep from “attacking or sticking to each other). When ravioli comes to the surface put them in individual dishes topped with sauce and grated ricotta salata ….